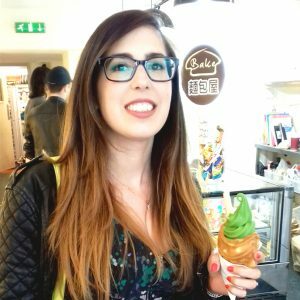 We visited London on Saturday to celebrate our sixth wedding anniversary and it was the perfect opportunity to visit two Japanese themed places I had found out about on Instagram. If you are interested in my Instagram, check it out here. 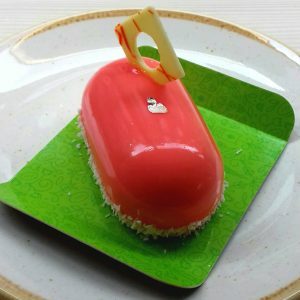 The first was Bake, which is a Japanese bakery that serves cakes and taiyaki, which are little Japanese fish shaped cakes, usually with a custard filling. 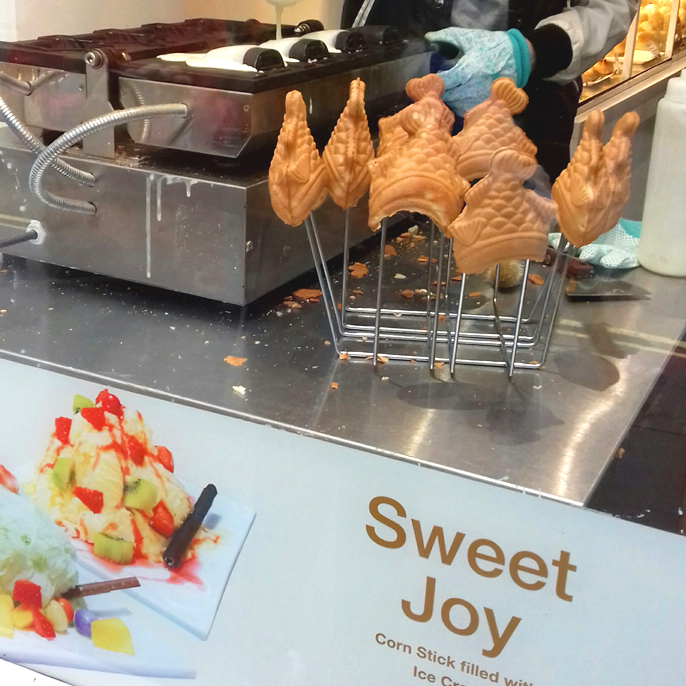 Bake also sell ice cream served in a hollow taiyaki. This I had to try! 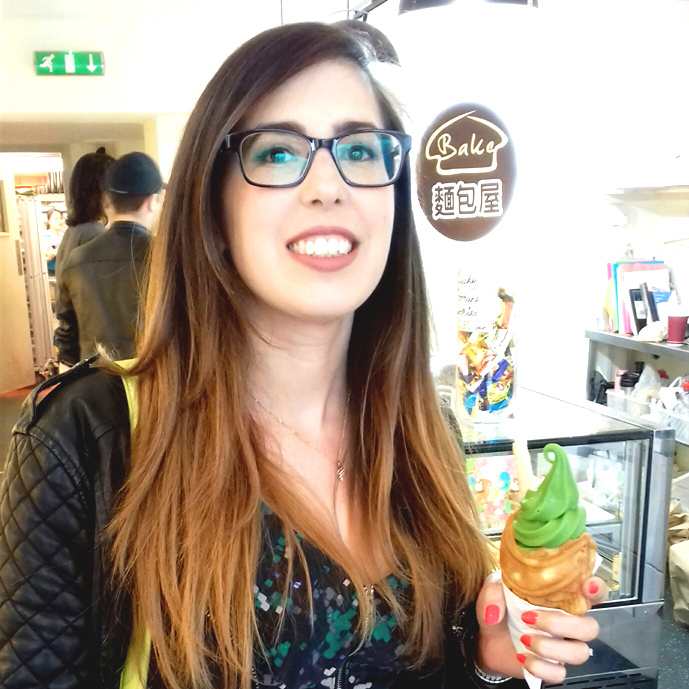 Unfortunately, the day we went to London, it wasn’t particularly warm, but that didn’t stop me from making a visit to Bake after a light lunch to try their ice cream taiyaki. It is a cute little shop tucked off the main drag of Piccadilly, just around the corner from Japan Centre and just before one of the big decorative entrances to Chinatown. 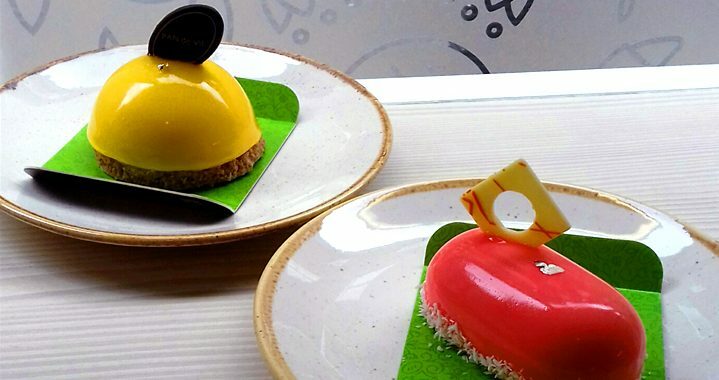 never seen such cute decorative cakes before! However, having gone to try their ice cream, it was this that I ordered. They had a choice of vanilla or green tea ice cream and I went for the latter. 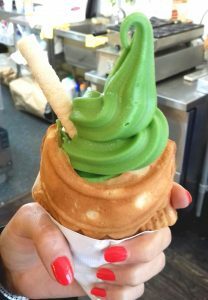 It is a soft serve ice cream, out of a machine like Mr Whippy…but bright green! The taiyaki is made from a sort of waffle type mixture, so it isn’t crunchy like a normal ice cream cone, but crunchy at the edges and softer in the middle. The green tea ice cream is smooth, creamy and yet not as rich as a normal ice cream and not as sweet. It came with a crunchy white chocolate filled wafer roll. The combination of taiyaki and ice cream worked really well, it tasted great and also had great novelty value for the shape and colour of it! They also have the machines making traditional taiyaki and hollow taiyaki in the window of the shop so you can watch the staff making them, which is cute. A definitely place to visit if you are in London and craving something to keep you cool as well as looking cool. 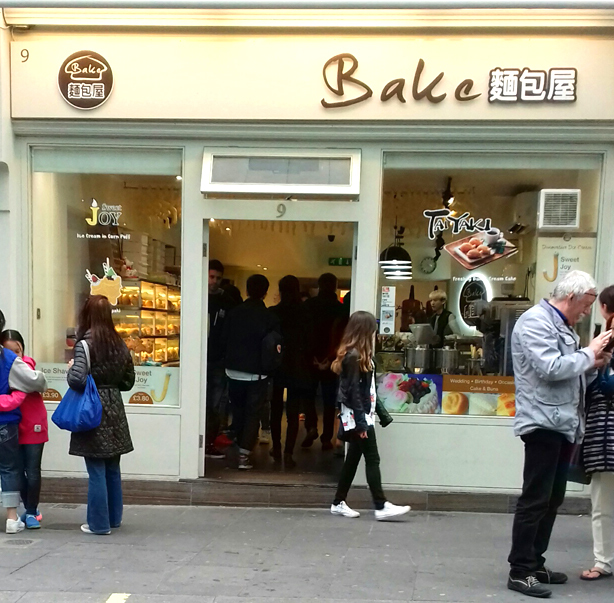 Later in the afternoon, we visited Covent Garden and hunted out Pan de Vie, an Asian-French fusion bakery with a dazzling array of patisseries and cakes. They are so beautiful and perfectly made that it is difficult to believe that they are actually edible. They have familiar French style patisserie cakes, such as eclairs and croissants but with a Japanese twist such as black sesame or matcha flavours. You can also sit in the bakery, which we chose to do by the window, so we could people watch whilst we ate. With so many choices, it was difficult to choose, but in the end I went for a pink passion cake, a bright Barbie pink glazed layer cake with coconut mousse, coconut cake and tropical fruit mousse and topped with a white chocolate square and silver leaf. 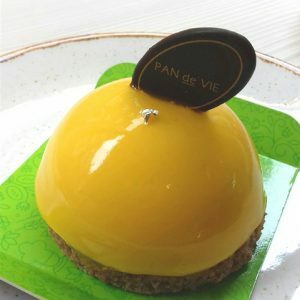 My husband chose a mango chocolate glazed cake, a brilliant yellow glazed layer cake with passion fruit jelly, mango mousse, chocolate cake and a crunchy base, topped with a chocolate Pan de Vie oval and gold leaf. The pink passion cake was beautifully tropical, combining coconut and tropical fruits to make delicately flavoured layers. It was lovely and light and not too sweet. I did try my husband’s too, which was really fruity but with the chocolate flavouring. I don’t know what was in the biscuit base, but I think it had white chocolate and it tasted great! I had a cup of green tea with mine, which actually went really well. 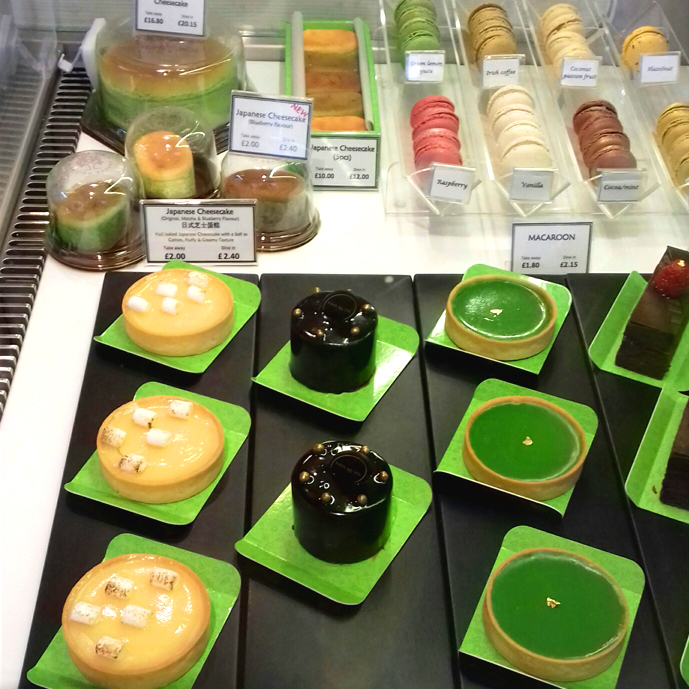 This is an amazing place to just view some exquisite cakes. They are pricey for what you are getting(ours were £5 each to eat inside the bakery), but for the experience and the superior quality of the cakes, I think they are worth it. Posted in Restaurant Reviews, Reviews and tagged Cake, ice cream, Reviews.